After more than 20 years of careful restoration, the world famous wall painting by Leonardo da Vinci, The Last Supper, was put back on display for visitors on this day in 1999. The masterpiece, which shows the different expressions on the faces of the disciples at the moment Jesus says the words, ‘One of you will betray me’, was finally back where it belonged on the wall of the refectory of the Church of Santa Maria delle Grazie in Milan. 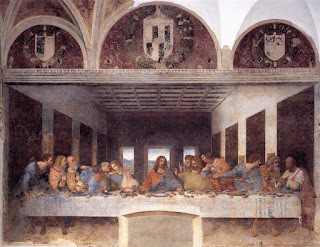 Commissioned by Ludovico Sforza, Duke of Milan, Leonardo began work on The Last Supper (known as Il Cenacolo in Italian) in 1495 and he completed it four years later. He felt traditional fresco painting techniques would not adequately capture the intensity he wanted so he experimented by painting on to dry plaster on the wall of the refectory. But his new method was not as durable as the traditional one and the painting deteriorated quickly. By as early as 1556, the painting was described by one commentator as ‘ruined’. 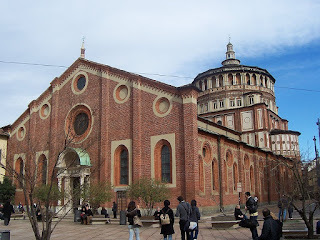 Over the ensuing years it suffered from poor restoration techniques, blatant vandalism by French soldiers, having a doorway cut into it to provide a shortcut for the monks, and wartime bomb damage. Sadly, by 1978 only a small part of Leonardo’s original work remained. A restoration project was mounted to reverse the damage and the refectory was sealed and converted to provide a climate-controlled environment for the painting. Using the latest techniques, the restoration team slowly removed everything that had been added after Leonardo completed the painting in 1498. Then the areas that couldn’t be repaired were repainted in subdued colours so that they could be distinguished from the original painting. After more than 20 years of restoration, which was four times longer than it took Leonardo to paint it originally, The Last Supper was again revealed for visitors to marvel at on 28 May, 1999. The refectory has since remained a protected environment and the number of visitors inside at any one time is carefully restricted. A portrait of a man in red chalk in the Royal Library, Biblioteca Reale, in Turin is widely accepted to be a self portrait of Leonardo da Vinci, drawn when he was about 60 years of age. The library, on the ground floor of the Royal Palace in Piazzetta Reale, was founded in 1840 to hold the many rare manuscripts collected by members of the House of Savoy over the years.